Bausch Datacom, originally founded in 1987 in the Netherlands by the family Bausch, evolved in the first 15 years of its existence, from a manufacturer of desktop modems for the banking world to rackmodems for Internet Service Providers and supplier of high end desktop modems for personal (Internet) use. As from 2003, the now Belgian owned, Bausch Datacom focused on applications for the Energy market, providing heavy duty modems for electricity meter reading and later on, in 2007, remote terminal units for the monitoring of the electricity grid. In 2012, Bausch Datacom started to develop electronics for the integration in charging infrastructure for Electric Vehicles. In 2018 the German company RITTER Starkstromtechnik bought 49% of the shares of Bausch Datacom to enter the ‘Smart Grid’ market on a European scale. 2018 Ritter Starkstromtechnik GmbH acquires 49% of the shares of Bausch Datacom. 2018 Embedded ‘M4’ firmware development for our new products ; DinBox GSM M4 DinBox RTU M4 InduBox RTU M4. 2017 Hardware design for the LOLO EV home chargers for eNovates Belgium. Enexis the Netherlands DALI project. 2016 Development of a Mbus wired to wireless 169 MHz or LORA convertor for DEWA Dubai. 2015 Seven year contract with Sibelga Belgium for delivery of a 3G router solution. 2013 Deal with Pacom Australia for PSTN socket modems. Contract with Atos Worldline Belgium for a 3G router solution. PPC [Public Power Company] Greece. ‘GreenWeCan’ wireless sensor project with Bausch 6LowPan RF hardware in Ghent Belgium. InduBox GSM modem project in Bosnia Herzegovina. 2009 Bausch Datacom Networking is sold to concentrate on our core business of industrial communication and automatisation. ISO9001/2008 certification. Large ISDN rack project for Indexis Belgium. 2008 Integration of IEC60870-5-104 in our RTU. 2007 Renewal of the iTron contract for delivering our InduBox GSM & PSTN modems. First contract with Infrax Belgium for our DinBox RTU. 2006 Contract for 3 years with RTE EDF France (together with Steel Belgium) for delivering our DinBox PSTN modem. device with build-in GSM communication for Fluxys (gas distribution) Belgium. 2004 - Large modem projects with GE Infrastructure Water & Process Technology (DinBox GSM). 2003 Integration of Delta Design BVBA within Bausch Datacom nv. ISO9001/2000 certification. 2002 First InduBox GSM modem. Created for electricity meter reading in the Belgian market together with Actaris/Schlumberger (today iTron). market ; ADSL, routers, WLAN, … Those IT products were sold within our Bausch Datacom Networking department. Coca Cola vending machines. All the shares including the Bausch Datacom brand name are owned by Dominiek Truyers. 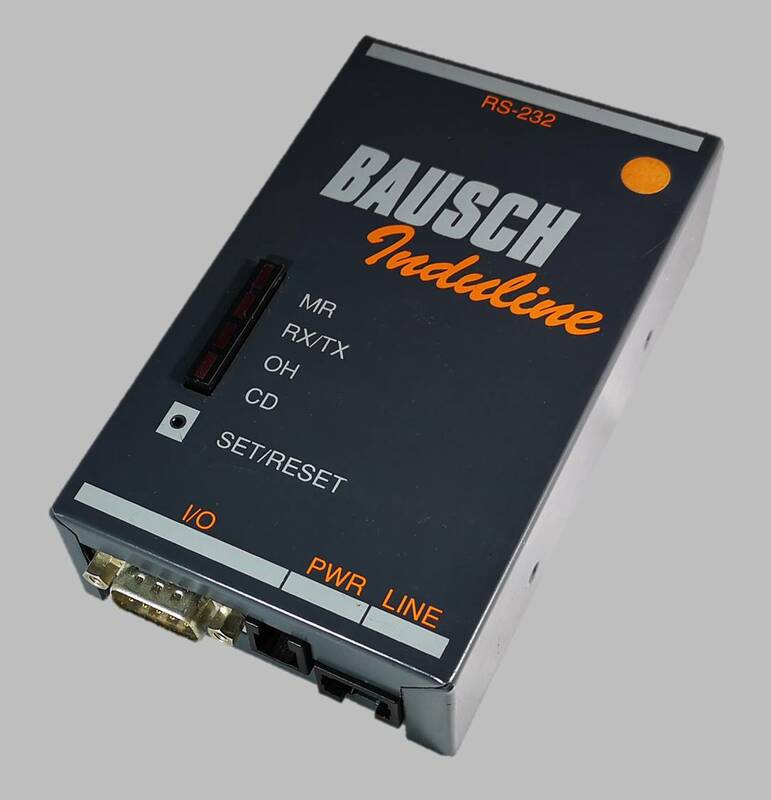 1999 Introduction of the Bausch InduLine, our first DIN rail mounted modem with some DIs [digital input]. the Netherlands via Allied Data. Allied Data already incorporated the modem brands Tron and Tornado. 1997 The rack modems were used in the first Internet POP [point of present] modem dial-in systems of Eunet. 1995 The Proxima modem technology was used to create a PCI, PCMCIA and a 19” rack modem version. 1994 Development of the state-of-the-art Proxima table-top modem. of options to start competition with established brands like Telindus and Nokia. 1992 Opening of Bausch Datacom in Paris France. Introduction of ‘CommPlus for Windows’ a complete modem terminal program. 1991 Development of a BBS [Bulletin Board System] software in cooperation with eSoft. 1990 Dominiek Truyers acquires 50% of the shares of Bausch Datacom NV Belgium. 1989 Subsidiaries in Heinsberg Germany and Leuven Belgium. 1988 Introduction of electronic banking with the Postbank. 1987 Bausch Datacom was founded in Roermond the Netherlands.